Imagine providing the Earth or a moon base with harnessed solar power, or ravelling in space without returning to Earth for fuel. 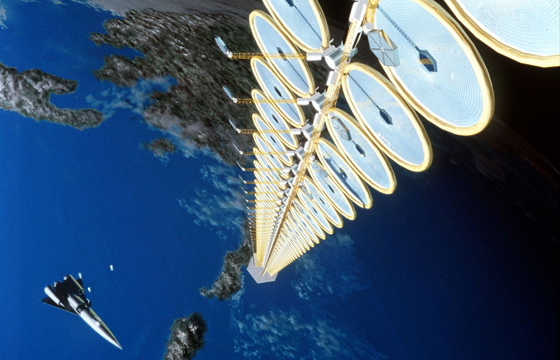 That’s the idea behind space-based solar power generators such as this SunTower. Courtesy, NASA. NASA’s involvement in space solar power, or SSP for short, began after the oil embargo of the mid-1970’s when the space agency (working under the leadership of the US Department of Energy) began to study alternative energy sources that might result in less dependence on foreign oil. Proposed space solar power systems utilize well-known physical principles  namely, the conversion of sunlight to electricity by means of photovoltaic cells. Giant structures consisting of row after row of photovoltaic (PV) arrays could be placed either in a geostationary Earth orbit or on the Moon. A complete system would collect solar energy in space, convert it to microwaves, and transmit the microwave radiation to Earth where it would be captured by a ground antenna and transformed to usable electricity. Clean-energy solution from space solar power explored in new blog – KurzweilAI.net, June 15, 2007. Friendship Solar Array Project by Ken Clements – August 9, 2006. A solution to border security and the world’s energy needs. Solar Power from Space by Steve Price, FirstScience.com – 2005.